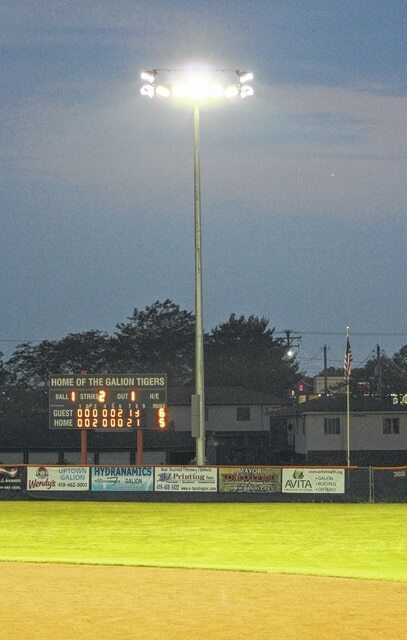 The new lights at Heise Park in Galion were utilized for the first time during Wednesday’s Great Lakes League game between Galion and Lima. Graders general manager Mike O’Leary said he’s pleased to have the lights operational, especially in time for the Independence Day weekend. The Graders will play at 7:05 p.m. Sunday at Heise Park with fireworks following the game. GALION — It was around 7:40 p.m. on Wednesday when the lights at Heise Park flickered to life. So what, you might say. Lights at a ballpark, no big deal. Right? Well, for the Galion Graders, the simple flip of a switch was a major victory. The seemingly never-ending battle to bring new lights to James D. Heddleson Field weighed heavily on the team’s staff throughout the first month of the season. Despite the fact that the hometown Graders lost to the Lima Locos 6-5 on Wednesday, the warm glow that engulfed the baseball diamond seemed to brighten the mood a bit for the management team. Rainy weather throughout the month of June was partly responsible for the delay completing the lighting project. Also, a sinkhole that developed beyond the right field fence had to be dealt with before the final light tower could be placed. With all of that behind them, O’Leary said the Graders management team is looking forward to what they hope will be a highly successful Independence Day weekend. Galion plays host to the Southern Ohio Copperheads on Sunday evening. First pitch is set for 7:05 p.m. As O’Leary noted, the annual Independence Day fireworks display will be presented after the game. The Graders game and fireworks wrap up a big weekend at Heise Park that includes the revival of the Pickle Run Festival, which is scheduled for Saturday and Sunday. Galion’s inaugural season as a member of the Great Lakes Summer Collegiate League has been a learning process for everyone involved with the team, O’Leary said. From a fundraising and sponsorship campaign that generated more than $100,000 to get the franchise off the ground to securing host families for the players, the process has been both taxing and rewarding. Something like the simple flip of a switch?